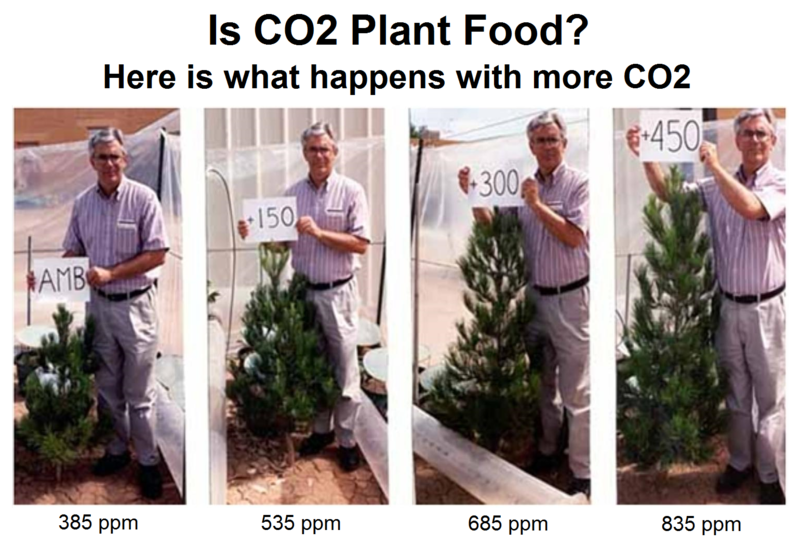 That’s why most commercial greenhouses use “CO2 generators” to raise daytime CO2 to about that level. It makes the plants healthier, faster-growing, and more productive. But the National Academy of Sciences would have you believe that global warming threatens agricultural productivity. So let’s examine that claim. Of course the headline obviously suggests that climate change hasn’t hurt corn and soybean production, so far. But that’s not the most interesting part of it. 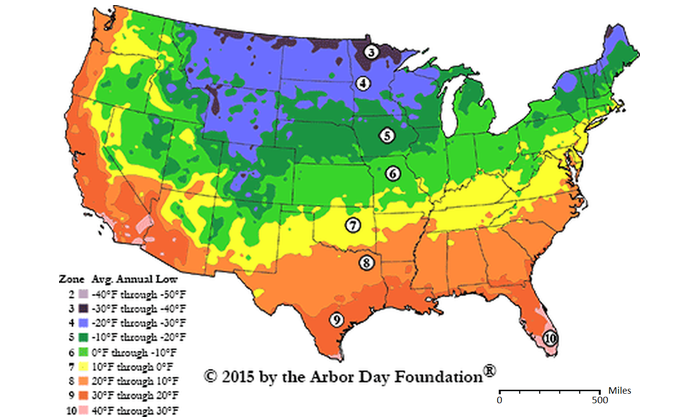 U.S. climate zones span 10°F, so the center-to-center difference between four zone numbers is 40°F = 22.2 °C. 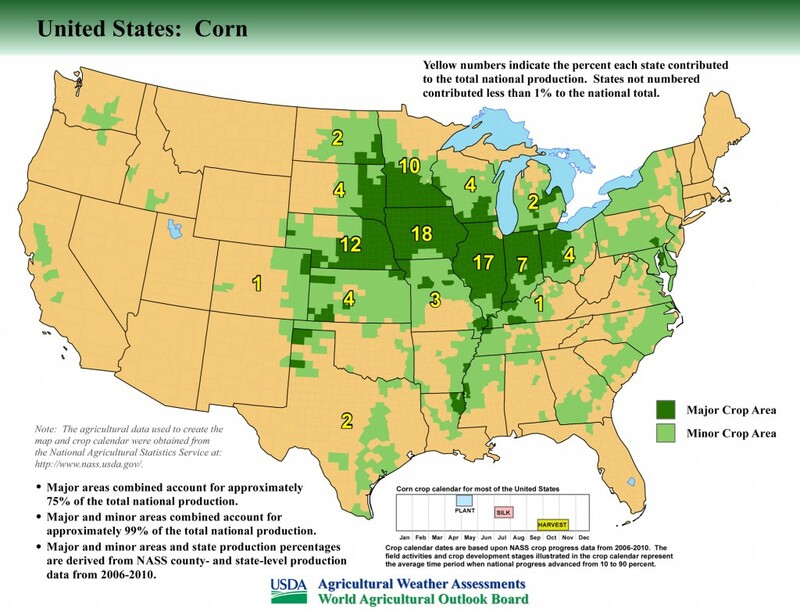 However, in this map you can see that Minnesota’s corn is mostly from the southern half of the state, which is a mix of zone 4 and zone 5, and Mississippi’s corn is mostly from the northwest half of the state, which is upper zone 8. So the average temperature difference between the middle of the prime corn-growing regions of the two states is a bit less than 40°F, I’d call it about 33 ±2°F. In Celsius, that’s a temperature difference of 17.2 to 19.4 °C (midpoint 18.3°C), between Mississippi (185 BPA) and Minnesota (191 BPA). In other words, it is plain that an average temperature difference of about 18°C has little effect on corn yields. What, then, are we to make of this PNAS paper? “Global Warming Will Sear Three of Four Major Grain Crops,” said the caption on Haaratz. 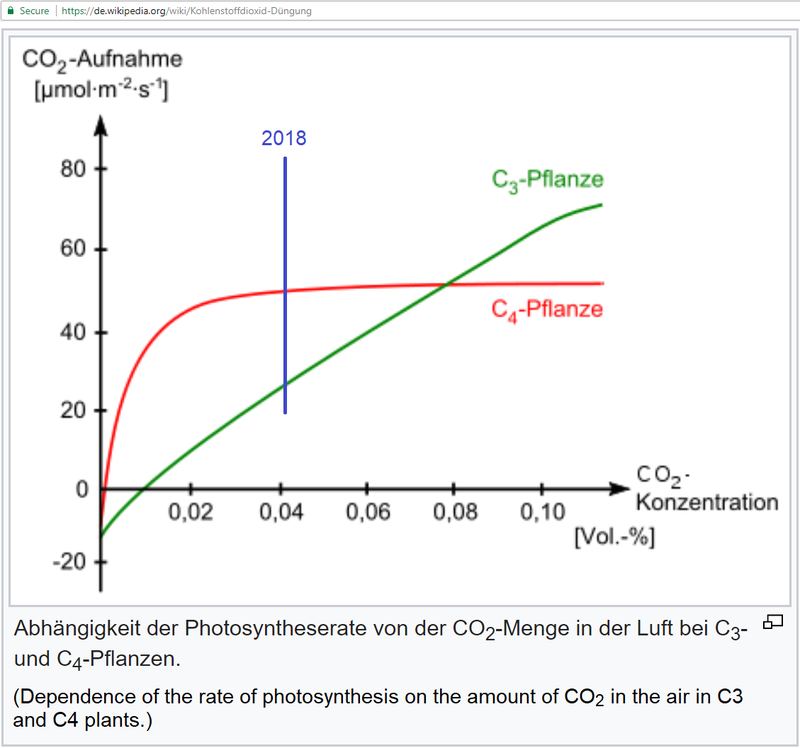 Of course “without CO2 fertilization” means they’re ignoring the beneficial effects of higher CO2 levels, which obviously divorces the paper from any pretense of presenting predictions of future reality. But it’s even worse than that. Can you guess what their assumption of no “effective adaptation” to a warming climate actually means? For annual crops, “effective adaptation” means adjusting spring planting dates, and perhaps adjusting cultivar selection. That’s all. So +4°C of warming is equivalent to planting about 24 days late. It’s utterly preposterous. The reality is that most farmers are not idiots, anthropogenic CO2 is highly beneficial “air fertilizer,” and the further that CO2 levels rise, the more productive farms will become. 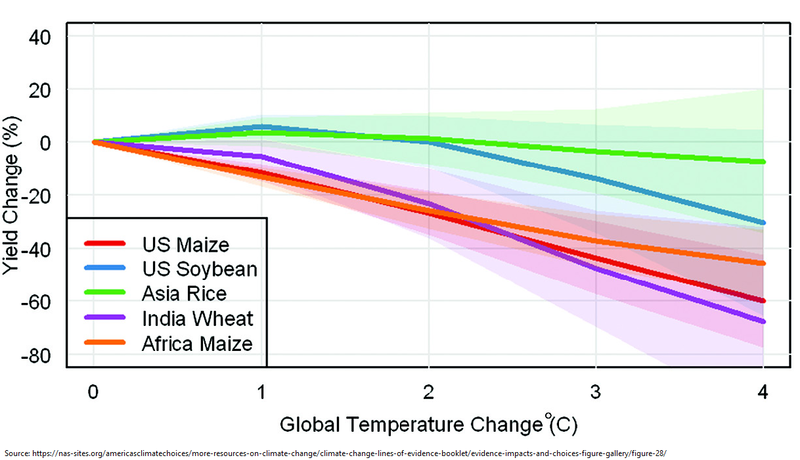 Notice the red “US Maize” and purple “India Wheat” traces, and where they intersect the 4°C line. You can see that they’re predicting that in the event of a 4°C temperature increase, U.S. maize (corn) yields would decline by a devastating 60%, and wheat yields in India would fall 68%. Today’s rant is this: That NAS / NRC graph is a lie. If a mere 4°C of warming were actually that destructive to corn yields, it would obviously be impossible to profitably grow corn even in Tennessee & Kentucky (zone 7, 174-175 BPA in 2018), let alone Mississippi (zone 8, 185 BPA). 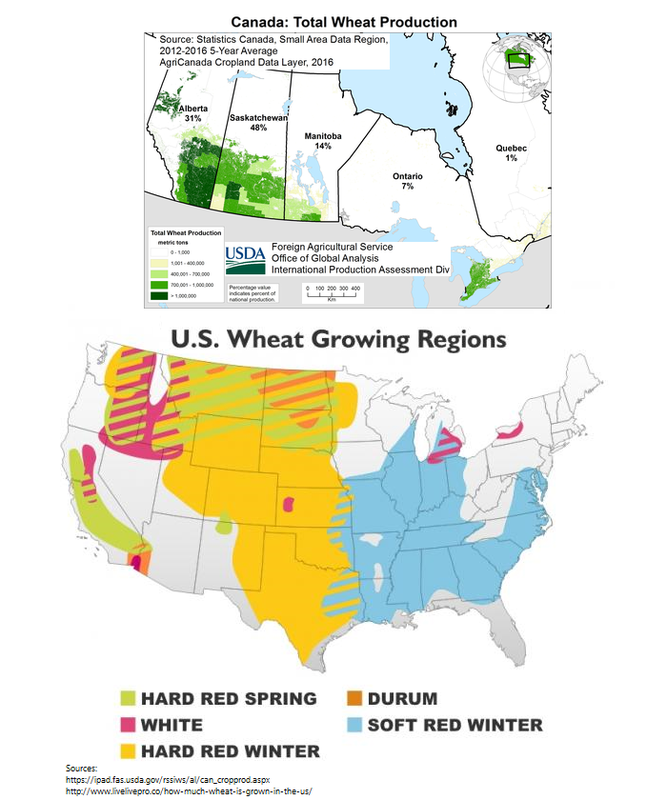 Likewise, if a mere 4°C temperature increase were actually that destructive to wheat yields, then it would obviously be impossible for North Americans to cultivate wheat across seven climate zones, from Saskatchewan to south Texas, spanning an average temperature range of about 35°C. Yet, despite their propaganda graph having been completely debunked, the NAS is still disseminating it, to promote the climate scare. If Zhao and his 28 co-authors really believe, as they claimed in their PNAS paper, that correctly assessing the impact of climate change on agriculture is “critical to maintaining global food supply,” then it is incredibly cynical of them and the NAS to publish misleading papers and graphs which encourage policymakers to take steps that will actually reduce that the global food supply. I’m beginning to wonder: Does the “A” in “NAS” is still stand for “Academy of,” or does it now stand for “Anti-,”?